Unity Garage is a family firm owned and run by brother and sister, Graham and Denise Moreton. The business was originally started by their father Dennis Moreton in 1973 who began by providing commercial vehicle repairs. Over the years the company has expanded to become the successful garage that you see today providing repair and servicing to various types of vehicles including diesel cars and large commercial vehicles. 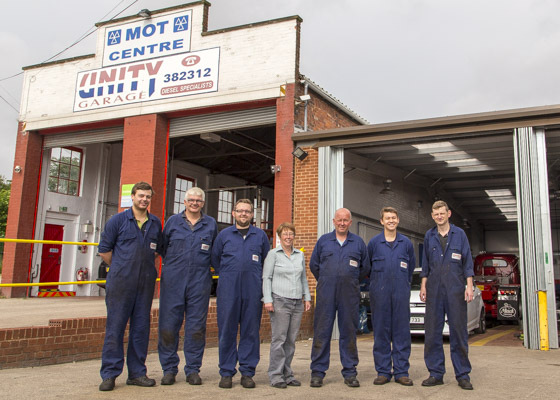 With over 38 years worth of experience Unity Garage understand the complexibilites of most vehicles including diesel engines and aim to provide a professional, personal, friendly service with customer satisfaction always being our number 1 priority. We strongly believe this combined with our expert workmanship is the reason that customers return to us time and time again. We are proud to be able to state that many of our customers have been with us for 10yrs or more! We have an established highly qualified workforce who are able to undertake servicing on diesel vehicles including cars, vans, small commercials, public service and light goods vehicles. Unity Garage Ltd are members of the Good Garage Scheme which ensures a guaranteed quality of work and peace of mind for our customers. Please go to www.goodgaragescheme.com if you would like further details and testimonials. Our servicing rates for all vehicles including diesel vehicles are highly competitive and we pride ourselves on the fact that our customers can come to us knowing that they can trust us to do a fantastic job at a reasonable price! If you would like to find out more about our services please feel free to contact us on 01226 382312 we are always happy to help. Alternatively you can contact us online by completing one of our online contact forms.